underway, but you can still be among the first to qualify for this important new coach certification. Positive psychology is sweeping the world of coaching, personal development, and human resources departments. If you're ready to apply, go here now. Additional 64 hours of recorded Master Coach Training for advanced coaches is optional along with additional services such as Q&A classes on coaching business success, positive psychology coaching study groups, and your own webpage on our positive psychology coach directory. APPROVED BY THE ICF FOR 125 HOURS, TOTAL. Registration is by application or telephone. Email info [@] schoolofcoachingmastery [.] com to ask questions or to make an appointment to ask questions or register. You already have a qualifying coach certification from the IAC, ICF, or from SCM, but want specialty training and certification in positive psychology. You already have a qualifying positive psychology credential, such as the MAPP, or CiPP, and want advanced training and certification in positive psychology coaching. 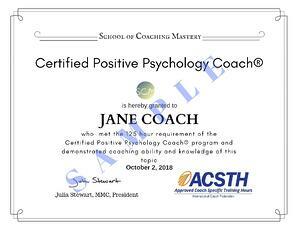 Coaches who already have the Positive Psychology Certificate from School of Coaching Mastery will get credit for the Introduction to Positive Psychology for Coaches course. Learn more about the Certified Positive Psychology Coach Program with these FAQ. What is positive psychology? Positive Psychology is the study of what helps human beings flourish and, as such, it goes hand-in-hand with effective coaching. Positive psychology began to develop in the late 20th Century and was officially recognized, as an area of study, in the late 1990s, when the Father of Positive Psychology, Martin Seligman, then President of the American Psychological Association, made positive psychology the focus of his presidency. Since then, a flood of research has been done on what thoughts, tools, attitudes, behaviors, and interventions promote well-being and help people flourish. What is positive psychology coaching? Positive psychology coaches use tools and interventions that have been identified by research into positive psychology and related fields, such as neuroscience, to help their clients achieve greater happiness, well-being, and success. They take research into positive psychology and translate it into effective tools for improving people’s lives, careers, and businesses. Read about positive psychology coaching on the Coaching Blog. School of Coaching Mastery weaves positive psychology interventions throughout its coach training curriculum. The Certified Positive Psychology Coach® Program is for coaches who want advanced training and experience in the art and science of positive psychology coaching. Why should you become a Certified Positive Psychology Coach®? How is this program different from other positive psychology training programs? This isn't just a coach-training program, nor is it just a positive psychology program; it's comprehensive coach training, based on positive psychology research and principles, that includes advanced approaches to coaching. Some positive psychology training programs will introduce you to coaching; this program offers beginner-to-advanced coach training using positive psychology. Certification is the gold-standard in coaching credentials. This is the only legally recognized Certified Positive Psychology Coach® training program. The Certified Positive Psychology Coach® Program is the first positive psychology coach training program to be approved for 125 hours ICF ACSTH, which qualifies our graduates to apply for ICF ACC or PCC without having to take the arduous portfolio route. The cost of your certification will be included with your tuition and once you're certified, you'll get a one-year free positive psychology coach listing in our coach directory. Because this program is new, we're offering it at an early adopter discount, making it thousands less than many positive psychology programs! Positive psychology is a relatively new area of psychology. It is also known as evidence-based psychology, as it is derived from studies of human behavior using scientifically valid methods. Combining this field with the also relatively new field of coaching is a powerful union that enables coaches to work with their clients to set and achieve goals in ways that are highly likely to be successful. The techniques used in positive psychology coaching stem from our expanding knowledge of changing human behavior, which is at the heart of coaching. The broader perspective of positive psychology, as a way to achieve even greater well-being, also aligns very well with coaching in general. I have been learning about and using positive psychology in my coaching practice for the past several years, and it gives me a great sense of professional stability in my work. I also use the techniques in my consulting work with people in job transition. I write a monthly newsletter on careers and workplace behaviors that draws heavily on positive psychology, which is well-received." In addition to live interactive webinars that you can join from anywhere, you’ll receive a wealth of curated resources, including videos, audios, websites, apps, and more, plus opportunities to practice your tools with like-minded positive psychology coaches. And you'll get ideas for how to grow your business with positive psychology. We invite you to sign-up for more information, so you can decide if becoming a Certified Positive Psychology Coach® is for you. Or if you're ready, apply now for free. If you are new to both positive psychology and coaching, you'll receive comprehensive training in beginner-advanced coaching skills, introductory-advanced positive psychology, coaching best practices, the brain science behind positive psychology, positive psychology niche coaching, positive psychology coaching practicum, positive psychology coach certification, and a listing on our coach directory as a Certified Positive Psychology Coach®. The full program takes one year to complete. Or email info [@] schoolofcoachingmastery [.] com for questions or to make an appointment to join the program. Students with advanced standing will receive a customized program with appropriate fee reduction. Our Certified Positive Psychology Coach® program is approved for 125 hours from the International Coach Federation, (ICF). Your instructor will be Julia Stewart, CiPP, MMC, President, School of Coaching Mastery. If you're interested in this innovative new program, be sure to fill out the brief form to the right. We'll keep you updated!